In parts 1 & 2, I discussed 8 ways to plot. 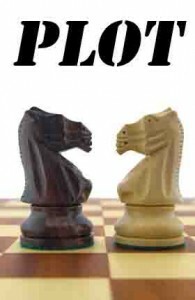 This last plotting idea is about deepening and extending the effectiveness of a plot. There are two books which stand out, not for their overall structure of a novel, but for deepening the impact of a novel: Donald Maass’ Writing the Breakout Novel (and the accompanying workbook, Writing the Breakout Novel Workbook) and Writing the Blockbuster Novel by Albert Zuckerman. Overall shape. Part of their strength is taking an overall look at the shape of the novel and making sure that all the parts match up. Does the beginning set up the end? Go past cliches. But they also force you to think deeper and reach for the answers that are less glib, but more true. These are actually less about plot and more about craftsmanship and commitment to excellence. And, by the way, success. 30-page outline. Specifically, Zuckerman’s insistence on a written outline of about 30 pages is interesting because it allows you to see major plot holes. His discussion of a sample outline allows you insights into some of his basic assumptions about story: for example, the antagonist and protagonist must meet in direct conflict in the climax. These assumptions seem to be largely unwritten anywhere in the literature of plotting and can only be inferred from Maass and Zuckerman. To the extent they lay bare the assumptions of great literature, they are vastly helpful. Comments? That’s my take on the ways of plotting as taught by some of the best writing teachers. What have I left out? Which plotting methods work best for you? Noble, June & William. Steal this Plot. Scofield, Sandra. The Scene Book: A Primer for the Fiction Writer. Vogler, Christopher. The Writer’s Journey. Vorhaus, John. The Comic Toolbox. Zuckerman, Albert. Writing the Blockbuster Novel.